Because there was no virtual reality market overview, I compiled one. Please let me know any errors or omissions, I may have made. I will try and keep this overview updated for your reference in this post. You can always find the latest version here. 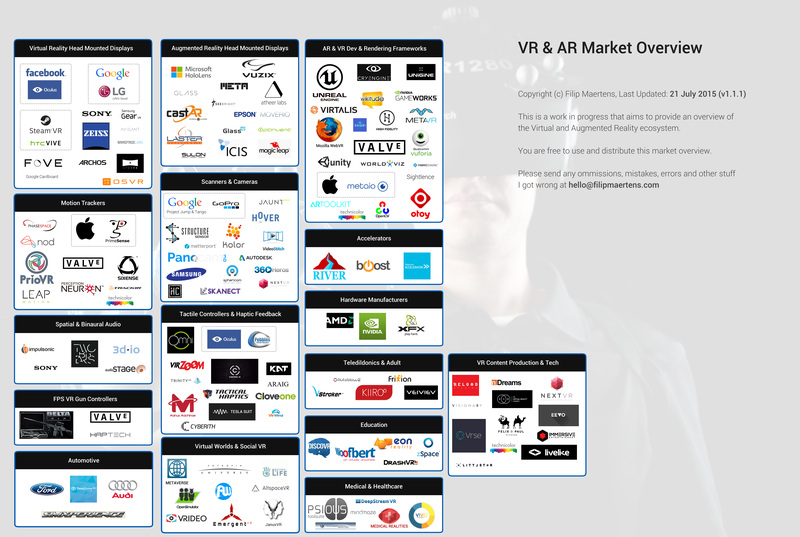 This post may contain an outdated version of the VR & AR Market Overview. Please visit the dedicated VR Landscape page for a latest version. ← Moments. The mobile currency. Don’t follow your passion. Follow the problem. My name is Filip Maertens, and I am a Belgian tech founder. I have a passion for technology, A.I, IOT, exploration, mountaineering and animals. All contents on my blog are personal opinions and based on private accounts of experiences.